Drinking enough water and getting a balanced diet can be hard to achieve in the office, as the day to day takes over and the temptation for cakes and biscuits also takes hold. For employees who are on-the-go, and out and about meeting customers and prospects, it can prove to be even harder; relying on fast food and sugary drinks to get them through the day! As more businesses look towards health and well-being in the workplace with various initiatives, we’ve put together some simple ideas on how branded merchandise can help to promote and encourage employees to adopt a healthier approach when it comes to their daily routine. It sounds simple but is often over-looked as the day takes hold! It’s well-known that drinking plenty of water has many benefits. It helps to provide energy and increase brain power, prevent headaches, flush out toxins and even helps to improve your complexion. According to NHS Choices’ page on water and drinks, we should drink around 6-8 glasses of fluid a day. Encouraging your employees to drink more can be done simply and cost-effectively by introducing branded water bottles. 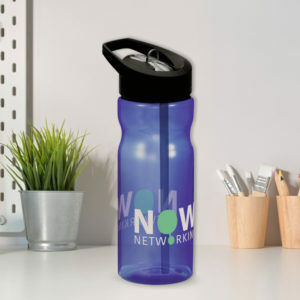 Whether employees are at their desk or out and about, the water bottles can be re-filled and on hand for them to use throughout the day, as well as acting as a constant reminder for them to drink more! Encouraging staff to eat healthily may be a little harder than getting them to drink more! While convenience food and meal deals are as they suggest, they aren’t always as healthy as they seem. Branded lunch bags, boxes and salad shakers, can be a useful tool in encouraging staff to eat healthily. Why not provide healthy lunch ideas to break a convenient routine?! Introduce a recipe board that provides ideas and tips for a balanced diet and encourage employees to share easy lunchtime recipes that they enjoy. 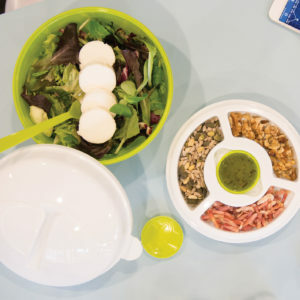 Creating a lunch space that’s social and engaging could also be a great way of encouraging a healthy eating culture. The space will also encourage employees to step away from their desks, ensuring they have their much-deserved break, helping them to feel motivated and refreshed for the afternoon ahead. As well as having a positive impact on your employees, (and possibly their wallets!) the use of reusable water bottles, lunch boxes and shakers will also help to reduce the amount of single use plastics and packaging when it comes to take-away drinks and food. Physical wellness is also important to an employees’ well-being. Many employees will have different fitness levels and motivation when it comes to getting active so this can be quite a difficult area to tackle. 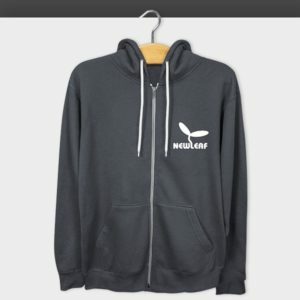 The introduction of a team hoodie will ensure everyone is part of the team before setting off from the starting blocks! Why not introduce a motivational half hour? This could be as simple as creating a lunchtime or after-work walking group - as well as the social element, employees will benefit from brisk walk and small steps could give employees the confidence to do more. We also have a range of products that can help to support gym membership initiatives or cycle to work schemes. If your company is embarking on a mission to promote employee health and well-being in the workplace, get in touch to see how we can help. Contact the team on 01623 636602 or contact us via the website or LiveChat. Creating a happy, and healthy environment for employees to work in can only have a positive effect. After all, most employers know, an engaged workforce is likely to be a productive one!